What should have been an enjoyable holiday weekend turned into tragedy and devestation for many in the South. There were 84 reported tornadoes from December 23-27. Hundreds of homes were damaged or destroyed and 25 people lost their lives due to tornadoes. While people began their final holiday preparations of wrapping gifts, baking cookies and traveling to visit friends and family, the weather behaved in a way many don't consider December-like. The East basked in record high summer-like temperatures, the West battled wildfires and the South experienced severe thunderstorms and tornadoes. As of December 22, the NOAA Storm Prediction Center had reported 10 tornado fatalities and was facing the possibility of a historic record low. By the end of the holiday weekend, that number had more than doubled. There were a preliminary 348 total reports of severe weather on December 23, 2015, including 51 tornadoes. The strongest of these storms occured in northern Mississippi. As damage surveys continue, one of these tornadoes has been rated as an EF-4. All exterior and interior walls of a home were destroyed to achieve this significant rating. There were 14 fatalities with these tornadoes. 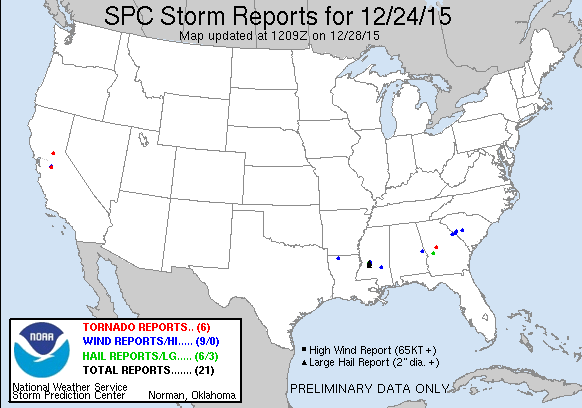 More severe storms occured on Christmas Eve and Christmas Day. Although a few weak tornadoes can been seen in California in the above images, you can see how the majority of reports are once again the in south-east. Hunkering down in a storm shelter was probably not the way these folks wanted to spend their holiday. Dallas, Texas was the scene of more tornado destruction on December 26. Tornadoes are bad, nighttime tornadoes are even worse. Without the flash of lightning or power lines, it is nearly impossible to spot a tornado at night. Although the above graphic shows 6 total tornadoes, damage surveys have found the paths of 9 around the Dallas metro. The strongest of these has been rated an EF-4. 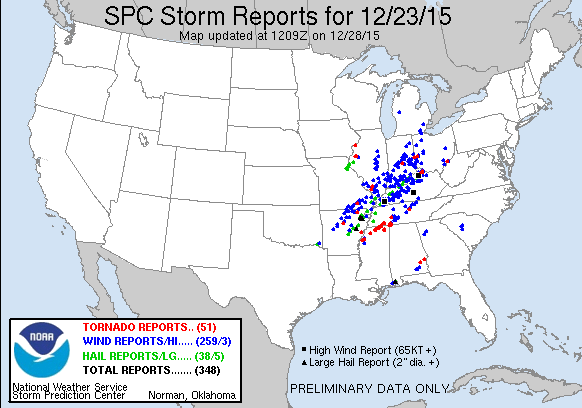 There were 11 more fatalities with these storms, 8 were in vehicles. Even more severe storms struck the South on December 27 and as I write this blog, storms continue to batter the same general area. Areas struck by tornadoes two days ago are experiencing freezing temperature and snow. And though many consider it unusual to have tornadoes in later December, you need to remember that the weather doesn't know what month it is and doesn't care. When you have the right ingredients for severe thunderstorms, they will occur. What you should remember to do is to always be prepared. One way to do this is to download our Weather Radio or RadarScope app to your smart phone. Keep aware of your surroundings and don't stop paying attention to the weather during the holidays - or any time for that matter!